Print-Rite Technology Development Co., Ltd of Zhuhai (PTD) have been developed the compatible laser toner chip for Brother Ⅱ series printers. As known, the consumables market share for Brother is increasing. In order to meet the market demand, PTD has marketed the black compatible chips for BrotherⅠTN760/TN2420 series in August 2018. From July 2018, Brother has successively launched the new generation A4 color laser printer HL-L3270CDW series in North America, Europe, Australia and other regions, which is called the Brother Ⅱ products in the marketplace. PTD decided to comprehensive launch the compatible chip, which is for Brother Ⅱ laser color toner cartridge. PTD is committed to providing more choices for the compatible chip market and providing customers with better business opportunities. 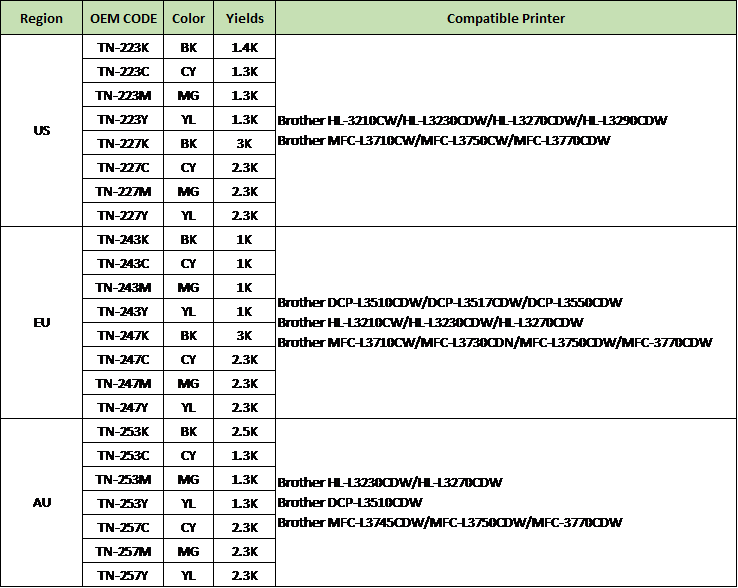 The details for Brother Ⅱ laser toner chip as below. And More information please contact PTD.